Life is super crazy in our house these days. I mean SUPER CRAZY. Gone are the days where I could spend hours testing out tons of new recipes at a leisurely pace. No, those days are lonnnng gone. With a super active 10-month old, I can barely get supper on the table, let alone putz around making an extensive list of recipes all day long. He’s either opening and shutting drawers in the kitchen, pulling the potatoes and onions out of the cupboard, attempting to pull himself up on the coffee table or rummaging through bags from our grocery shopping trip. I am CONSTANTLY chasing after him. So, my latest strategy is whipping up the easiest possible recipes. Like EVER. The less ingredients, the better. And if it just so happens that they can be made in less than 10 minutes, even BETTER. 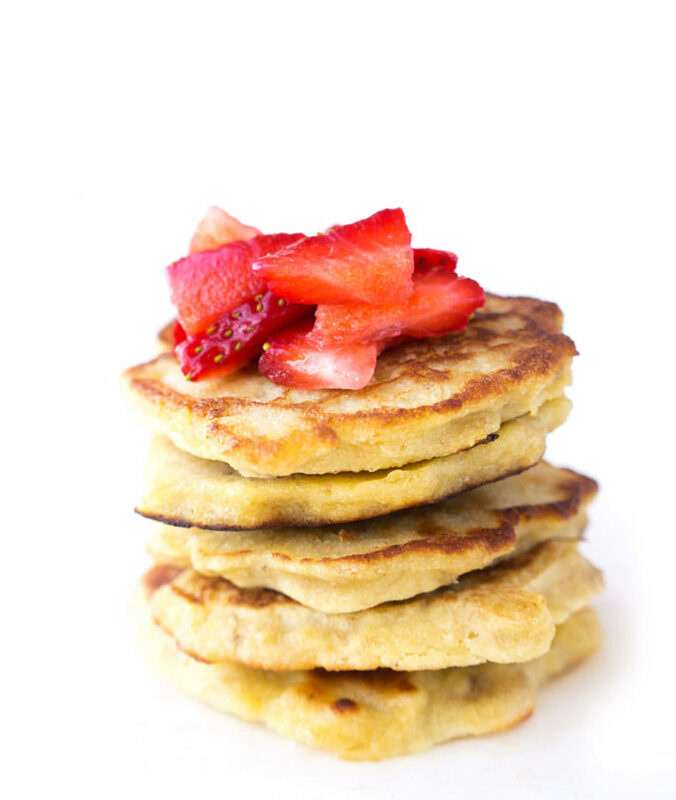 A prime example of this strategy-in-action are these mini 2-ingredient pancakes. 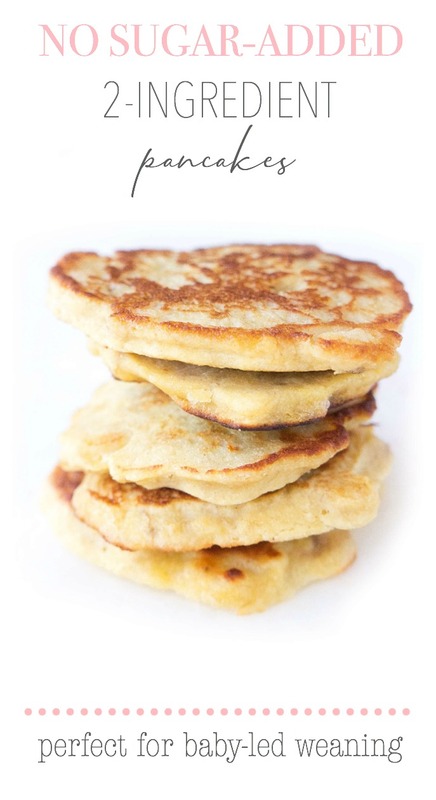 I have been making these mini pancakes ever since our little guy started on solids several months ago. We decided to go the baby-led weaning route, and as a result, our baby has become quite the little foodie. Meaning, when meal time rolls around, he anxiously awaits his food and watches me like a hawk while I prepare his food. Let’s just say that he makes it very clear when his tummy is hungry. Which also means, that this mama ain’t got no time to waste. I need quick and easy meals that I can get on the table in a matter of minutes. BUT being the health-conscious mother that I am, I also refuse to resort to processed convenience food. I want quick and easy, but I also want healthy. That’s why these pancakes have been such a lifesaver. 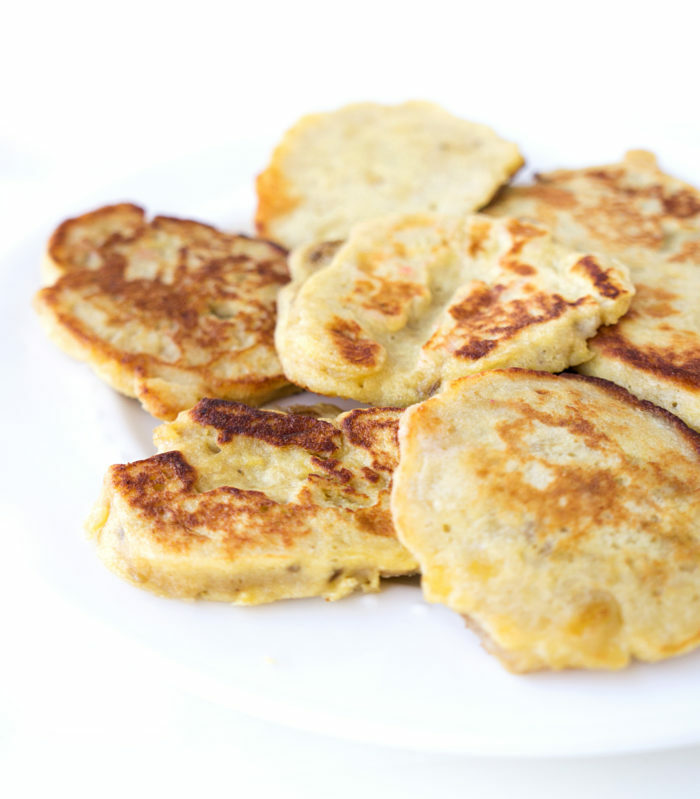 They require only an egg and banana, two ingredients that we pretty much always have on hand. I like to add a little bit of coconut flour to the mixture too, just to firm the pancakes up a bit and give it a bit more of a coconut flavour, but this step is optional. 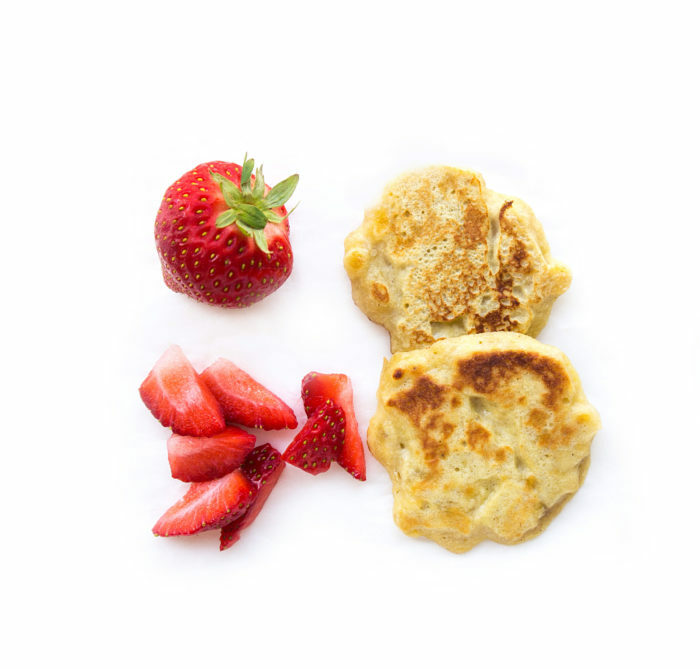 The end result are these mini naturally sweetened pancakes with slightly browned and crispy edges, perfect for little hands and mouths. I like to serve them with some fresh berries for some extra flavour, fibre and vitamin C, and sometimes I’ll spread some almond butter or natural peanut on top to add some healthy fats. These not only make a great quick and easy meal for at home, but they’re also perfect for taking on the go. 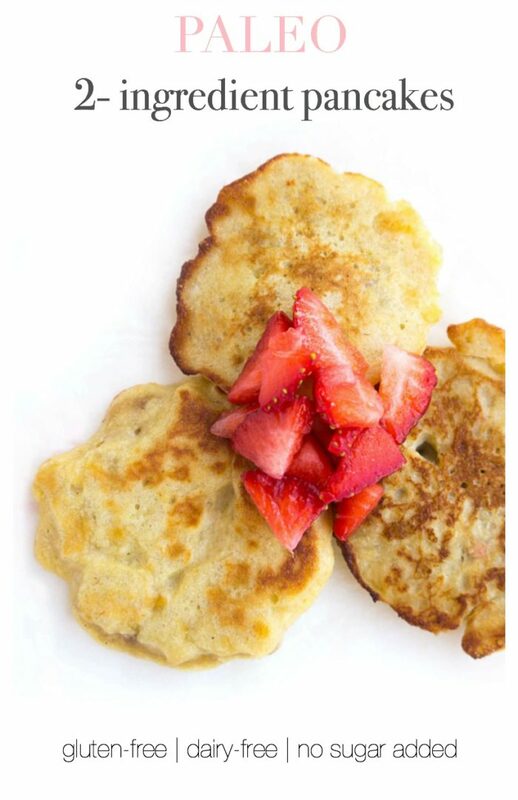 You can even make up some extra mini pancakes in advance and freeze them in a ziplock bag so that you always have some readily available to grab-and-go. 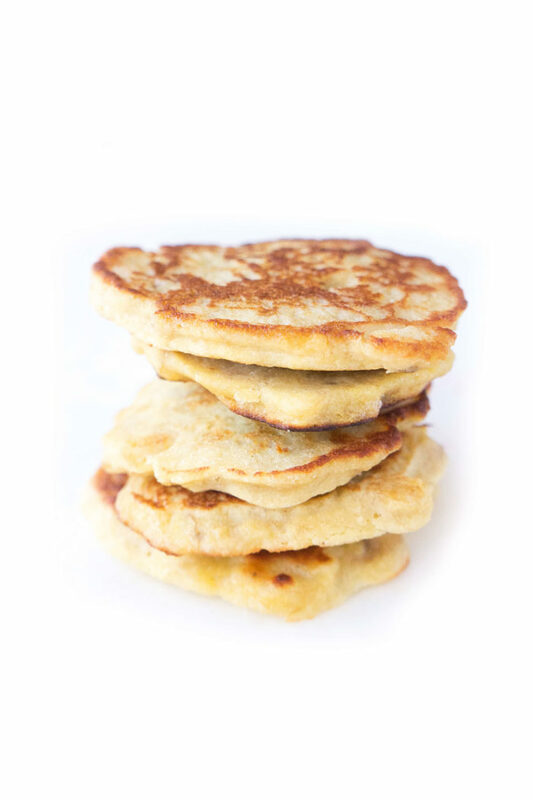 I love these pancakes because they’re a source of protein, fibre, and potassium, they can be made in 10 minutes TOPS, and they don’t create a big mess. My little guy loves them because they keep his tummy happy. And that makes this mama happy. In a medium frying pan, heat the coconut oil over medium heat. 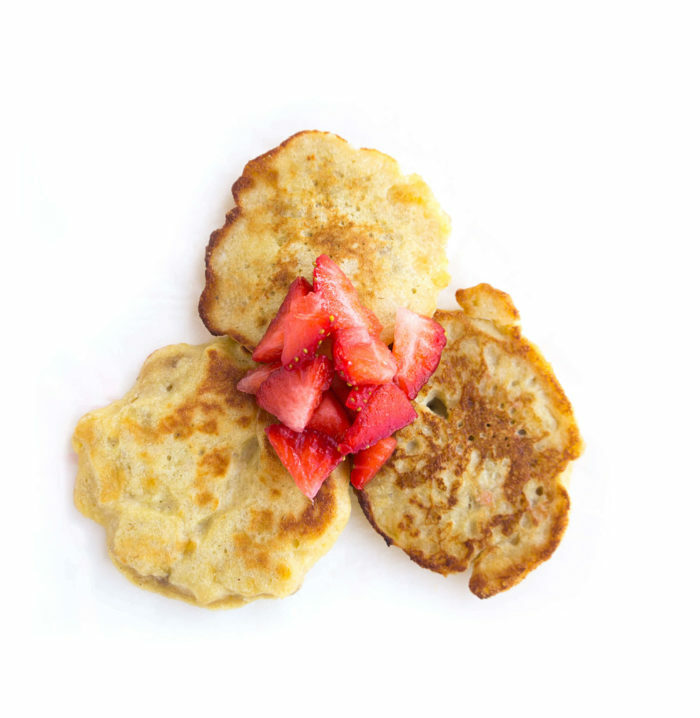 Using a tablespoon, scoop the pancake mixture into the frying pan to form mini pancakes. The mixture makes about 8 mini pancakes. Cook for 2-3 minutes on one side, or until firm enough to flip. Flip the pancakes and cook for another 1-2 minutes on the other side. Serve plain or with berries, almond butter or peanut butter. * You don't have to add the coconut flour, but I found that it helps to firm up the pancake slightly. I have tried making the pancakes with just the egg and banana, and they still turned out, but were a little more flimsy. P.S. 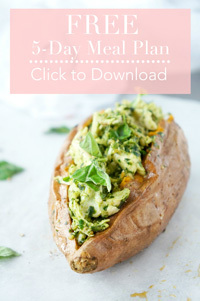 If you’d like to get more healthy recipes, style & motherhood tips sent to your inbox, subscribe below to receive my weekly updates!